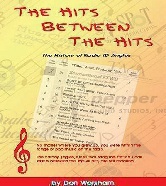 The Media Preservation Foundation Press has published the book THE HITS BETWEEN THE HITS: THE HISTORY OF ID JINGLES by Don Worsham. Over ten years of research went into writing this 300+ page book chronically documenting the history of ID jingles from its infant days into the ninties. This book is a must for every serious jingle collector! This book can be yours for only $37.50 + shipping ($6.00 in the USA). Sorry - No longer available outside of the USA). The basic's budget minded series features full-mix cuts (NOT including alternate mixes) of jingle packages digitally transferred from the original master tapes. All included jingles are delivered via download in .WAV format for optimum quality. 6 - Gemini FM - TM Century - We Play The Hits - 1996 (3' 20"). Due to the fact that the majority of purchases are of non-tangible items (mostly downloaded audio), MPF has a "no refund" policy. 6 : KSAN – Thompson Creative – Composite (10’48). Muff Murfin - Worcester, UK; S2Blue/Steve England - Sale, UK; Thompson Creative Productions (a division of Zone Radio Imaging, New York NY) and/or Johnny Hooper, Dallas TX. All copyrights are still in force. All Rights Reserved. Unauthorized duplication prohibited. All jingles are for personal use only. They are NOT licensed for broadcast and may not be shared or posted in full online.